I'm trying a new home care product that says it's great for acne, but I'm concerned that it's hurting my acne instead of helping. Any sort of inflammation can contribute to acne flares for those with acne-prone skin. Overly stimulating treatments, peeling agents that are too strong or used too frequently, excessive extraction, fragrances in products, or stimulating products or treatments can cause inflammation in the follicles. When the follicles are inflamed, the follicle walls swell. This obstructs follicle aeration, which keeps acne bacteria in check, and can cause sudden flares of papules, or what you know as pimples. This is known as an acnegenic reaction or flare. Acnegenic flares are often seen when new home care products are introduced. This may indicate that the product is too rich, too stimulating, or generally inflammatory to sensitive skin. Evaluate your products and make a record of when you have flareups to know what might be a contributing factor. Mark Lees, PhD, MS, CIDESCO, is a skin care educator, product developer, therapist, and author. This is a silly question to ask, but will I feel differently after different kinds of massage and bodywork? That's not a silly question at all; it's insightful to realize that bodywork modalities each have their own unique intended outcomes! Hands- on therapies range from very gentle touch for hospital or hospice patients to more specific clinical work to treat an injury or area of pain. Some styles focus on stretching the body while others may incorporate acupressure point work. 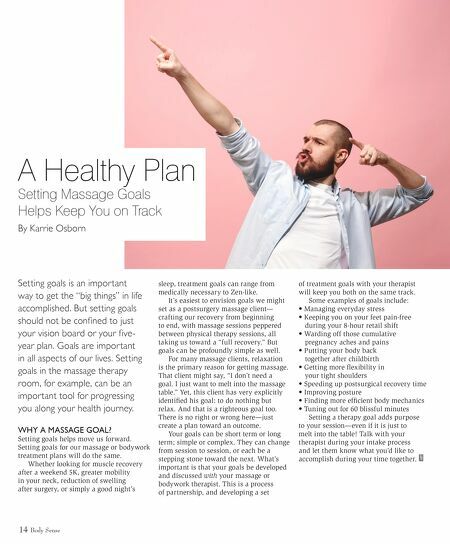 Even a therapeutic session where a massage therapist is using a variety of techniques to tailor the work to your needs can leave you feeling either relaxed enough for a nap or energized for a 5k depending on the depth, pace, and intention of the work. Discuss with your practitioner how you'd like to feel after your session so they can incorporate the bodywork modality that's right for you! A S K T H E E X P E R T S Q & A Kristin Coverly, LMT, is a massage therapist and educator for Associated Bodywork & Massage Professionals. Learn more about the different types of massage and bodywork by visiting the www.massagetherapy.com glossary for an A–Z guide of over 250 modalities.